Your Echo Administrator can create an individual subscription to a particular course in the digital library. Select the User ID for the desired user and open the Subscriptions tab. Course: Enter the course name or ID in the field to search the current domain (required); to broaden your search, check the Search all domains box. Domain: Enter the domain name or ID (required). 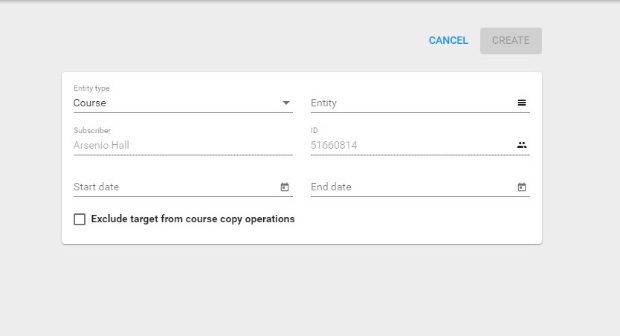 If you don't want the user to be able to copy courses from the target course or domain, check the Exclude target from course copy operations box. To disable a subscription, check its box and click Remove; check multiple boxes to remove more than one at a time. Click Edit in a subscription's column to make changes.